Since Graduating from NYU College of Dentistry in 2000, Dr. Kamlesh Jethani has continued to stay abreast of the latest technology. She has spent hundreds of hours in study clubs, seminars and several continuing education courses.Dr. 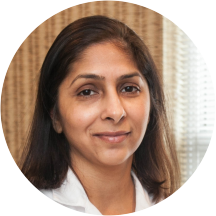 Jethani understands that dentistry is not a “one size fits all” and her approach treats the whole patient, focusing on communicating with the patient on their needs, wants and desires. This leads to excellent patient care and happy smiling patients.Your comfort is always her main concern. Dr. Jethani and her husband have 2 kids. When away from Englewood Family Dentistry she enjoys her family time often traveling to NYC for a show or to the beach in the summer. Best dentist ever. Highly recommend. She has patience, understanding, true professional, excellent bedside manor, quick, painless. Love this dentist. Dr. Kamlesh and staff are great! Very professional! very professional, but personal and attentive. She is kind, accommodating and very professional. Go to her twice a year. Dr. Jethani saw me within 10 minutes of arrival. She was efficient and careful and answered all of my questions. I had a cavity, and she was able to do my filling during my appointment, which was great. I had an awesome visit! ?? Comfortable first visit, everything went well. She is an excellent Professional Dentist. My only problem is that I do not have Dental Insurance & she is very expensive. Everything went very smooth and efficiently. Dr. Kamlesh Jethani, DDS has no appointments on Zocdoc right now.